When I was a kid (kinda still am depending on who you talk to) I tended to use the little blocks to make spaceships, guns, (not very good) swords and towers. Even now I still like to play around with it a little from time to time though. 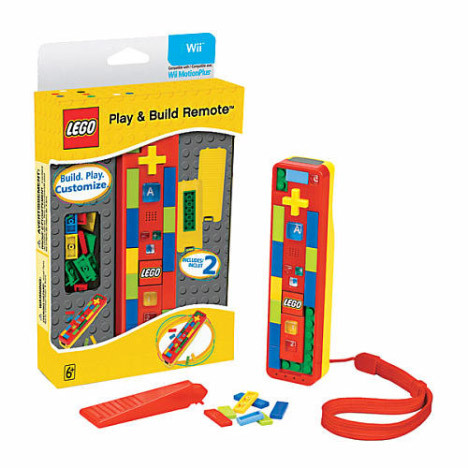 What’s tons better though, is that as an exclusive product to Toys ‘R’ Us, you will soon be able to get your hands on a LEGO Wii remote. The remote itself isn’t actually built out of the little plastic bricks but rather it allows the user to stick on extra little lego pieces that come in the box or you can use any that you have lying around the house. From looking closely though, we don’t think you’ll be able to add tons and tons to the remote but rather the remote looks like it gives you a few spaces on which to place a few little bits here and there. It should be available to purchase a little later this week, and priced at around $40, we can’t complain especially due to the novelty value. If you ever get one for yourself (or your kids of course) we’d love to see some of your inventions but what we have noticed is that you may not want to get too over-board with your design as this may infringe on some of the Wii controls and hinder playtime. Otherwise, have a blast and let us know what you think.